IRRI is developing rice varieties that can withstand conditions forecast to become more frequent and intense with climate change. This includes drought, flood, heat, cold, and soil problems like high salt and iron toxicity. Environmental stresses constrain rice production, affecting about 30% of the 700 million poor in Asia alone who live in rainfed rice-growing areas. These stresses can be caused by extreme climatic changes like drought, flooding, or rising sea levels. While some can be inherent like high iron toxicity in the soil. Our breeding programs aim to develop rice types that can survive in these harsh environments. IRRI breeders use a breeding method known as marker-assisted breeding. It helps breeders incorporate specific desirable traits into new varieties with more accuracy and speed. In recent years, IRRI has developed rice with better tolerance to drought, submergence, cold, salinity, and sodicity. Our national research and agricultural extension partners test these breeding lines in different locations and countries, including evaluating their performance on farmers’ fields. The selected lines which survive under stress and retain desirable grain qualities are either released directly or bred into widely grown and popular local varieties. Along with improved crop management, proper use of technology through extension work and the support of national institutions, these improved varieties or “climate change-ready rice” are showing substantial, positive impacts in the lives of poor farmers. 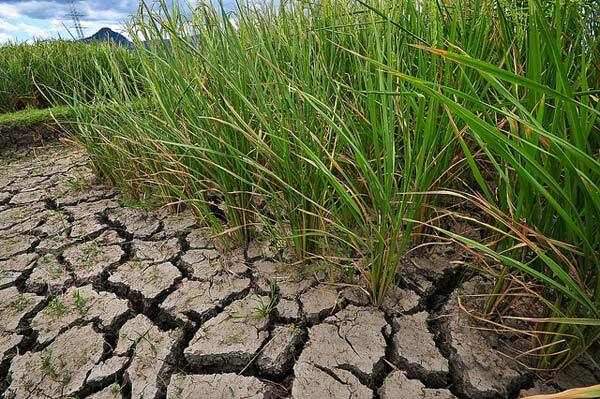 Drought is the most widespread and damaging of all environmental stresses, affecting 23 million hectares of rainfed rice in South and Southeast Asia. In some states in India, severe drought can cause as much as 40% yield loss, amounting to $800 million. IRRI has developed drought-tolerant varieties which have been released in several countries and are now being planted by farmers. These include Sahbhagi Dhan in India, the Sahod Ulan in the Philippines, and the Sookha (Sukkha) Dhan varieties in Nepal. Across these varieties, the average yield advantage of drought-tolerant varieties over drought-susceptible ones is 0.8-1.2 tons per hectare under drought. IRRI scientists have identified several key regions of the rice genome—called quantitative trait loci (QTLs)—that give the rice drought tolerance and improve rice grain yield under such conditions. IRRI is working towards introducing drought tolerance into popular high-yielding rice varieties including IR64, Swarna, and Vandna. We are also studying what the molecular and physiological processes that these drought-tolerant QTL provide to get a better insight into this complex trait. Floods can affect rice crops at any stage of growth. These could be short-term flash floods or long-term stagnant flooding. Flooding can also happen immediately after seeding, which leads to low germination and poor crop stand of direct seeded crop. The crop suffers varying amounts of losses depending on the frequency and intensity of the the flood. This may range from yield reduction due to moderate stagnant flooding to complete crop loss under complete submergence. Countries such as India, Bangladesh, and Nepal in South Asia and Myanmar, Cambodia, Laos, Philippines, Vietnam, and Thailand in Southeast Asia suffer varying degrees of losses due to floods every year. For example, during floods, farmers in Bangladesh and India lose up to 4 million tons of rice per year—enough to feed 30 million people. In 2006, the Philippines lost harvests worth $65 million to floods. While most of the high yielding rice varieties suffer heavy losses due to floods, several landraces with tolerance to different forms of flooding have evolved across Asia. For example, deepwater rice varieties are able to elongate rapidly to survive while most of the high-yielding modern varieties cannot elongate enough. If floods last for more than a few days, the rice plants expend large amounts of energy trying to unsuccessfully escape that they are unable to recover after the flood. Plant breeders have discovered that a single gene, the SUB1 gene, confers resistance to submergence of up to 14 days. Scientists were able to isolate the SUB1A gene, derived from an Indian rice variety, and identify the genetic control of submergence tolerance. The SUB1A gene activates when the plant is submerged, making it dormant and conserves its energy until the flood water recedes. This allows the plant to successfully recover after the flooding. Several high-yielding submergence-tolerant varieties have been developed with the SUB1 gene. These varieties have shown a yield advantage of 1–3 tons following flooding for 10–15 days. Flood-tolerant varieties that have been released and are now being planted include Swarna Sub1 in India, Samba Mahsuri in Bangladesh, IR64-Sub1 in the Philippines, and Ciherang Sub1 in Indonesia and Nepal. Submergence tolerance is also being combined with stagnant flooding tolerance at present to develop rice varieties with higher robustness and tolerance to different forms of flood. Millions of hectares of land suited to rice production in Asia and Africa are currently not used because of high salt content. Rising sea levels brings salt water further inland, contributing to soil salinity. In Bangladesh’s coastal areas, salinity affects about one million hectares of land that can otherwise be used for rice farming. Rice productivity in salt-affected areas is very low — less than 1.5 tons per hectare. But this can potentially increase by at least two tons per hectare with improved varieties that can withstand soil salinity. IRRI scientists have identified a major region of the rice genome called Saltol that gives the rice plant tolerance to salinity. Saltol is being used to help develop varieties that can cope with exposure to salt during the seedling and reproductive stages of the plant. The same approach used for developing submergence-tolerant mega-varieties is being used with Saltol for salinity. This is particularly targeted at coastal areas during the wet season where both salinity and submergence are problems. Recent work at IRRI has shown that the SUB1 gene and Saltol can be combined in the same type of rice, increasing the rice plant's tolerance to salinity and submergence. 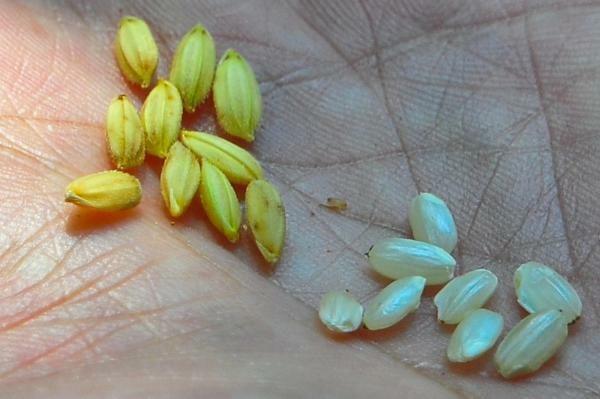 Plant breeders have incorporated Saltol in popular rice varieties such as the BRRI Dhan 11, 28, 29 varieties released in Bangladesh, and popular varieties in West Africa. 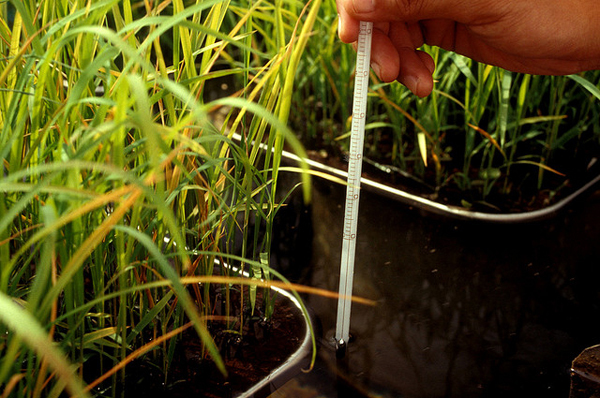 To date, IRRI, with the help of its national partners, has developed more than 100 salinity-tolerant elite lines. These elite lines possess superior traits such as high yield, good eating quality, resistance to pests and diseases, and tolerance of stresses, and are ready for testing in farmers’ fields. Global warming has a significant effect on rice production. Though rice originates from the tropics, high temperatures of more than 35 degrees Celcius during the reproductive stages reduces rice production, especially when the rice plant flowers when the high temperature occurs because it causes low seed setting and low yield. Higher night temperatures during the ripening stage also decrease rice yield and grain quality. Further, even at the vegetative growth stage, heat stress can cause leaf yellowing and accelerated development, leading to low yield potential in sensitive rice varieties. Rice plants are most sensitive at the flowering and ripening stages. Both yield and grain quality are adversely affected. IRRI scientists are looking for rice that can tolerat high temperatures by screening improved and traditional rice varieties. These donors are used in a crossing program to incorporate tolerance of high temperature into elite rice lines that are then tested for heat tolerance in ‘hot and dry’ and ‘hot and humid’ countries. Another mechanism for rice heat tolerance is early-morning flowering, which escapes the high temperature at midday. It was found that O. glaberrima, a wild species of rice, is a useful genetic source since it has a habit of early-morning flowering and high transpiration with sufficient water, both of which are convenient traits for avoiding heat stress. IRRI scientists are looking into the causes of this useful trait through physiological and genetic studies. Frequently occuring low temperature causes more than 50% yield loss. Diseases such as blast and sheath brown rot adds to the damage especially when it attacks at the plant’s early vegetative stage. In China, the recorded yield loss due to low temperature is 3-5 million tons. In 1980, Korea lost an everage yield of 3.9 tons per hectare, more than half of its annual yield per hectare. Cold tolerance is a complex trait controlled by many genes. IRRI scientists have identified three regions of the rice genome that have a direct link to cold tolerance at the plant’s reproductive stage. Cold stress at critical times of reproduction hinders the formation of fertile pollen that is crucial for fertilization and consequently the rice plant may fail to produce grains. IRRI’s collaboration with South Korea’s Rural Development Administration paved the discovery of a cold-tolerant breeding line called IR66160-121-4-4-2 that inherited cold tolerance genes from Indonesia's tropical japonica variety Jimbrug and northern China's temperate japonica variety Shen-Nung89-366. Using this line, IRRI crossed cold-tolerant and cold-sensitive rice lines and evaluated the progeny under two separate stress conditions – cold water in the field and cool air temperature in the greenhouse. After the experiment, they selected some promising cold tolerant lines that also have desirable spikelet fertility and early maturity traits. These breeding efforts form part of a bigger research initiative under the Temperate Rice Research Consortium. Nutritional imbalances such as potassium and zinc deficiency and iron and aluminum toxicity are widespread in most rice production areas in Asia, Latin America, and Africa. Genetic donors for tolerance of these soil problems are being identified and used in breeding. Iron toxicity is a widespread growth constraint in lowland rice in Africa. 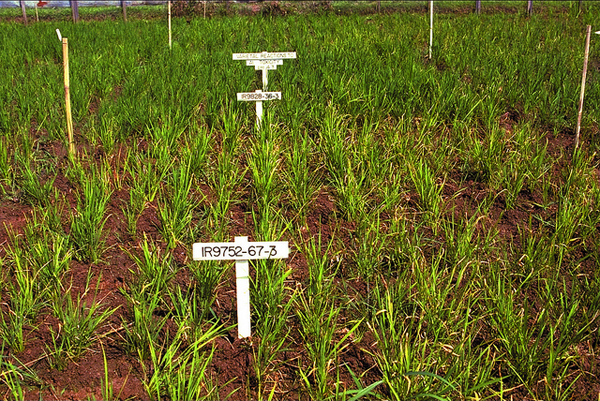 IRRI has identified highly tolerant varieties or lines such as Suakoko 8 (O. sativa) and CG 14 (O. glaberrima). The Africa Rice Center (AfricaRice), IRRI’s partner in the region, has facilitated the release of some improved varieties that are tolerant of iron toxicity. At AfricaRice, breeding is under way to validate tolerance to iron toxicity and to identify new regions of the rice genome that also provide the plant with greater tolerance.